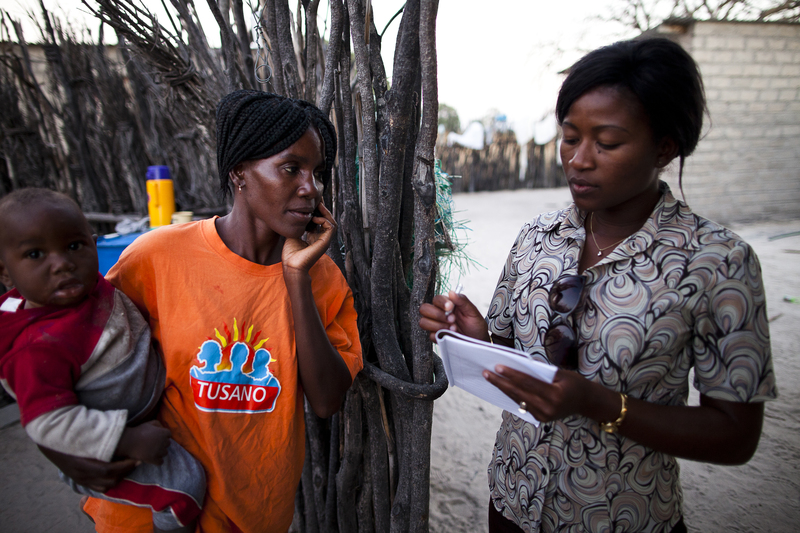 Above: A health worker provides outreach care near Ondangwa, Namibia. Photo by Trevor Snapp. Job descriptions for health workers—it seems like a simple concept. And in fact, job descriptions can increase a community’s access to high-quality health care in low-resource settings. But many health workers in low-income countries don’t have this basic tool.For example, only 57% of health workers in Namibia and 38% of health workers in Kenya have job descriptions, according to data from Service Provision Assessments conducted by the countries’ Ministries of Health. Research conducted in Kenya shows that health workers who have written job descriptions provide higher-quality care than those who do not. This may be because job descriptions provide structure, guidance, accountability lines, minimum skills and qualifications standards, and performance benchmarks. They may also play a role in health worker motivation. Health workers who feel motivated may be more apt to stay and feel satisfied in their jobs. My own research, using data collected from over 1,600 health workers based in every health facility in Namibia, shows a very strong correlation between the presence of written job descriptions and perceived job promotion opportunity. Health workers who have written job descriptions are significantly more likely to feel that promotions from their current positions are possible. This perceived opportunity might motivate health workers to strive for optimal performance. In health systems encumbered by worker shortages, supply ruptures, financial deficits, and infrastructure inadequacies, we need to understand and seize opportunities to motivate people. Job descriptions can be highly political. But if job descriptions hold such promise, why do so many health workers in some countries lack them?Developing and distributing job descriptions can be an arduous and contentious process, often centralized at the national level and dependent upon approvals from several ministries—for example, a ministry of health may designate a position, but the ministry of finance may approve the budget for it. Bureaucracy and lack of resources lead to long delays. District and facility leaders may not have the authority to develop job descriptions for those they supervise directly, so they rely upon ministries with whom they have little contact to provide them. Job descriptions can also be highly political. They formalize the relationships among qualification, responsibility, remuneration, and hierarchy. Health workers must often perform outside their scopes of practice to compensate for inadequate staffing. Consider the reluctance that highly trained staff may have in ceding their authority to lower-level workers when those lower-level workers have to take on more responsibilities. Consider also the related discontent of workers who do not receive more pay for the extra work. Developing appropriate, standardized job descriptions on a national scale is a monumental task that demands significant time, expertise, and financial resources, all of which are in high demand in low-resource settings. Individual facility needs, support structures, and resources vary greatly. Take, for example, a highly congested urban clinic and a remote rural clinic. In theory, their nurses will share similar job descriptions, but in practice the roles will differ greatly. 26% of the health workers interviewed in Namibia had not received a visit from their supervisors in the previous six months. Ministries aiming to centralize and standardize the process need to address a wide range of contexts and stakeholders, such as regulatory agencies, in order to develop meaningful job descriptions. And then there’s the physical distribution of these job descriptions. Simply printing out and delivering them may require Herculean effort in countries that lack roads, computers, communication technology, and resources (such as vehicles and fuel) for transportation. Supervisors who would distribute job descriptions—not to mention orient and supervise health workers according to them—may visit the facilities only rarely. My research shows that 26% of the health workers interviewed in Namibia had not received a visit from their supervisors in the previous six months. Ministries of health don’t conspire to withhold job descriptions. The problem is that they are often overwhelmed just trying to provide essential services to their populations. Overstretched ministries are understandably reluctant to invest in initiatives that don’t have immediate or tangible benefits. Human resource management often languishes on the backburner while disease-specific fires are tended. In so doing, we can work with ministries to determine how best to direct and motivate their precious resources in ways that will improve health outcomes across the board. Kate Sheahan conducted this research as part of her 2014 IntraHealth-UNC Summer Fellows Program.